Card Size: 5" x 7", Printed on 100 lb card stock. Sold in pack of 10 invitations and 10 white envelopes. You will receive a proof by email within 1 (one) business day. Please check your email! We will not print and ship until we have a Final Approval! Once approved, your invitations will ship in 24 hours. INVITATIONS - Welcome! 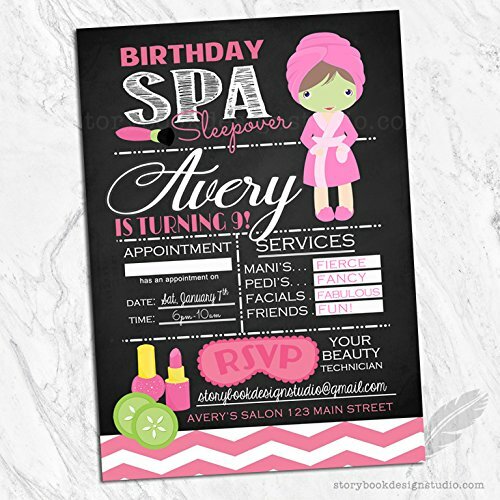 These invitations are perfect for your Spa Themed Birthday Party! INVITATIONS - Each order includes 10 5" X 7" Personalized Invitations printed on 100 lb Cover Stock and includes 10 White Envelopes! CUSTOMIZATION: Please click on the yellow "Customize Now" button on the right side of your screen to add all of the information for your event. PROOF: Once we receive all of the necessary information needed to complete your order we will send a proof via an Amazon message. (Please be sure to watch for our message to ensure a quicker processing time) Respond as quickly as possible with your approval or note any changes. NO orders are printed without this approval. PROCESSING & SHIPPING: Once we receive your approval to print, your invitations are printed and shipped within 24 hours. The quicker we receive your approval, the quicker your invitations can be printed, processed and shipped to you. If you have any questions about this product by Storybook Design Studio, contact us by completing and submitting the form below. If you are looking for a specif part number, please include it with your message.